Purple used to be a color reserved only for Royalty. It was a sign of status. It fits, then, that foods which are purple are ones that can improve your health and diet. The health benefits of blueberries and even the acai berry have been in the spotlight for some time, but there are other foods that share the deep hue that you might not know about. What’s So Special About Purple Vegetables? “If I could eat only one color per day, it would be purple.” said James Joseph, who is a neuroscientist at Tufts University’s USDA Human Nutrition Research Center On Aging. He’s not the only health professional raving about these foods. The National Health and Nutrition Examination Study, a survey of eating and health habits found that adults who eat purple vegetables and blue fruits have reduced risk for high blood pressure, lower cholesterol and less likely to be overweight. This is all about a little something called anthocyanin. This is a plant compound, or phytonutrient. It’s what gives the rich purple color. It mops up free radicals in the system and also soothes inflammation. Not only does it fortify the immune system from disease, it has been shown to improve memory and over all brain function. Despite this, purple vegetables and fruits only make up 3 percent of the average American’s intake. You probably remember your mom telling you to eat your greens at the dinner table. Sometimes, it was a chore to choke down vegetables. A lack of variety often makes people wary to jump onto a healthier diet. What’s the first purple vegetable that pops into your mind? Cabbage? Good news is, you don’t have to eat tons of cabbage to get the health benefits of these super foods. 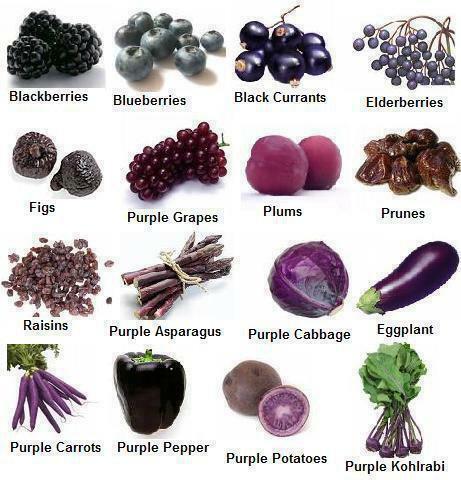 There is a wide array of purple fruits and vegetables. And those are just some of the purple vegetables readily available at local and big box markets. Any food that has the purple or blue color, especially fruits like blueberries and blackberries, contain the anthocyanin compound. It’s easy to incorporate these foods into your normal diet. You could sprinkle blueberries onto your cereal or you could slice purple grapes and purple carrots and add them to a salad. There are plenty of recipes out there, and you can swap in the purple version of a vegetable for its original. Something to keep in mind when preparing these types of fruits and vegetables is that some purple foods store their nutrients in different areas. For example, eggplant has the anthocyanin in its skin, not the meat. The main health benefit there comes from eating the skin. You don’t need to choke down fruits and vegetables you don’t like in order to get the nutrients your body needs. There are always options and variety to fit your palate. In the case of purple vegetables, they often taste the same as their non-purple counterpart, can be prepared the same way, and can add a lot of color and style to just about any meal you prepare. Rich in color, rich in flavor, purple vegetables take the crown. Try the local library for prenervisg food. As an alternative, load a google search engine and use it for the same purpose. You should have a pressure cooker in good condition or an oven that will heat the canning jars to the proper temperature. Also jar lids and tempered canning jars. – Great post! I started these cngahes with my family over 2 years ago now. It’s been baby steps, but worth every one. Best wishes on your journey, sounds like you are off to a great start! Just harvested my first 60lbs of purple potatoes. Making another batch for fall harvest. Eating the little ones right out of the garden they have a slight turnip taste to them. Still love em though.